He had an extensive military career during which time he was Chief of the Imperial General Staff from 1937-39 after which he became C-in-C British Field Force until 1940. From 1940-41 he was the Inspector-General of the Home Guard as well as having the responsibility to the Forces for training. 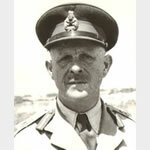 He served as Aide-de-Camp to King George VI until 1944, during which time he was also C-in-C Gibraltar until 1942, followed by C in C Malta from 1942-44. From 1944-45 he was the High Commissioner and C-in-C for Palestine as well as High Commissioner for Trans Jordan. He was the Commandant the Honourable Artillery Company 1943-46. He was the father in-law of Major W P Sidney, also a recipient of the Victoria Cross. On 27th September 1918 at the Canal du Nord near Flesquieres, France, Lieutenant Colonel Gort led his battalion under very heavy fire and although wounded, when the Battalion was held up, he went across open ground to obtain assistance from a tank and personally led it to best advantage. He was again wounded but after lying on a stretcher for a while, insisted on getting up and directing the further attack which resulted in the capture of over 200 prisoners, two batteries of field guns and numerous machine-guns. He refused to leave the field until the success signal had gone up on the final objective.